The Legal Genealogist had two grandfathers who served in the armed forces during World War I, that war to end all wars that the United States entered 100 years ago this week. The two men never met. And all I can say is… thank heavens. As with many Americans, the bulk of his service records was lost in the 1973 fire at the National Personnel Records Center in St. Louis.6 But we do have a few surviving records. 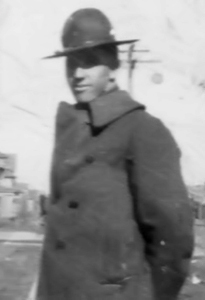 And those surviving records tell us that his service was as a private in the U.S. Army in the 39th Balloon Corps, trained at Camp John Wise near San Antonio7 and then sent to Fort Sill, Oklahoma. Now change gears with me for a moment to my father’s father. And from at least as early as 1912 until sometime after his 14 February 1918 marriage to my grandmother,9 he served as in the German Army. But from photos that have been handed down in the family, we know that he served for a time in the Grenadier-Regt. 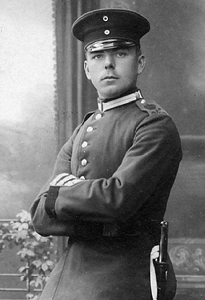 König Friedrich I (4.Ostpreußisches) Nr.5 (Danzig) XVII Armee Korps. And for a time in the 128th Infantry Regiment. And from those same photos, we know what his assignment was in the German Army. He was assigned to the anti-aircraft corps. No, my grandfathers never met. Not here in the United States, where my German-born grandfather died in 1945,11 before his son — my father — ever met the woman who would become his second wife. And not during World War I, that war to end all wars that the United States entered 100 years ago this week. That war in which one of them was supposed to be going up in the air. And the other one was supposed to be shooting down the people who were going up in the air. Poignant post. Beautifully written. Thanks for sharing, Judy. I’m also glad they never met, because then we wouldn’t have wonderful YOU! You’re right that it was the 39th Balloon Company, not corps. These stories remind me of the serious conclusion to a very funny speech once given by a noted genealogist in which he described America’s genealogical history in terms of generations of rebellious young people refusing to accept the prejudices of the past in favor of marrying who they loved. “In America,” he said, “we marry our enemies and they become part of the family. Isn’t that better than going to war with them?” he asked. Since responses to Sean’s comment in the previous blog post are closed, I’m posting here to let Sean know that Ancestry has databases of digitized indexed cards created by the United States government that summarize service by United States citizens and residents in the Canadian and British armed forces during World War I.
I join others in being grateful that your two grandfathers did not meet during the Great War. I am reminded of my own grandfather, the son of a German immigrant lied about his age in order to volunteer to fight in an artillery unit for the American Expeditionary Force in the Great War. His paternal uncle was and Sergeant in the German Army. Casualty lists show that Uncle Franz was seriously wounded and apparently invalided out of the German army before his nephew and his comrades triumphantly entered Germany. However, my grandfather did go to visit his uncle while he was a uniformed soldier in the US Army. That had to be weird for neighbors and family. My grandfather liked his uncle so much that they actually considered setting up as partners in a shop in Germany. I’m glad they did not, because he never would have met my grandmother. Several years later, Uncle Franz emigrated to the US. So we had three siblings on the same side of the ocean once more. However, there were still cousins remaining behind in Germany, so the whole process was repeated when my uncle and several American cousins all enlisted in the US armed services for WWII, while their German second cousins were fighting for Germany.